Somerset Willow's casket line . 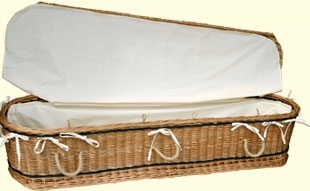 Somerset Willow Coffins include an unbleached cotton liner with every casket. While well-woven, these liners aren't completely waterproof. The liners are tied in and any absorbent cloth pad can be added just prior to use if needed. Ties can be shown (as pictured) or concealed. Woven willow handles are standard and test to the full weight of the casket. Natural hemp rope handles may also be special ordered in advance.